* admission protocol is downloaded and award is switched to active by the organizer. ** organizer has decided to disqualify the bidder. The approptiate document is downloaded and award is manually switched to unsuccessful . ~~ admission protocol is not downloaded and award is not switched to pending by the organizer in time. ~ contract is switched to cancelled and award is manually switched to unsuccessful . * document was downloaded to contract. The contract itself was successfully activated by the organizer. ** there was no document uploaded. The organizer refused to activate the contract. The procedure receives active.qualification status. The award initially receives pending status. The awarding process enters the verificationPeriod phase. 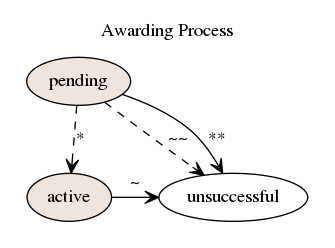 If the actions needed are not completed, the award auctomatically receives unsuccessful status, so that the procedure will be switched to unsuccessful as well. 2.1 If the organizer decides to disqualify the bidder, a document ( documentType: rejectionProtocol or act ) has to be downloaded first and the award has to be manually switched to unsuccessful then. The procedure will be given unsuccessful status this way. When the conditions are met, the process enters the verificationPeriod . During this term the organizer uploads the protocol ( documentType: auctionProtocol ) first and manually switches award to active status then. Simultaneously the awarding process enters the signingPeriod phase and the procedure receives active.awarded status. 3.1 If the organizer decides to disqualify the bidder, a document ( documentType: rejectionProtocol or act ) has to be downloaded first and the award has to be manually switched to unsuccessful then. It is then when the qualification procedure enters the signingPeriod stage. The contract of the qualifying bid initially receives a pending status. Within this time, the organizer should upload the document ( documentType: contractSigned ) in the system and manually switch contract to active status in order to successfully finish the qualification procedure. 4.1 For the bidder to be disqualified a document ( documentType: rejectionProtocol or act ) has to be downloaded first and the contract has to be manually switched to cancelled by the organizer then. As long as such an action is done, award status will receive unsuccessful . The auto-generated period duration does not influence the actions which can be done. The organizer can disqualify the award at any stage of the awarding process up to the moment, when a document with the documentType: contractSigned has been downloaded. Awaiting for the protocol to be uploaded and confirmed by the organizer. The valid bidder is able to submit the protocol as well, although it is not sufficient to move to the next status. Auction protocol ( documentType: auctionProtocol ) was downloaded so that the award could be switched to active by the organizer. 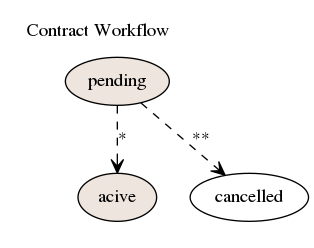 The document ( documentType: contractSigned ) was downloaded so that the status of the contract object could be switched to active by the organizer. Terminal status of award. Rejection protocol or act ( documentType: rejectionProtocol/act ) was downloaded so that the award could be switched to unsuccessful by the organizer. Or when the contract becomes status cancelled , the status of the award will be unsuccessful . Terminal status of contract. Rejection protocol or act ( documentType: rejectionProtocol/act ) was downloaded so that the contract could be switched to cancelled by the organizer.